The India Initiative 2016-2017 brochure highlights events and programming from the fall 2016 semester and provides information about the India Innovation Studio. 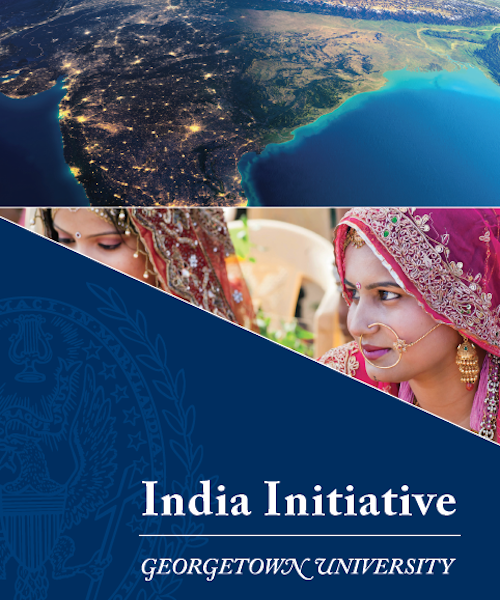 The India Initiative, founded in November 2015, builds on Georgetown University’s core strengths—academic excellence, location in Washington, D.C., and Jesuit mission of service to the world—to advance research and teaching around India and world affairs and create a platform for high-level dialogue among American and Indian leaders from government, business, civil society, and the academy. India’s economic potential, democratic culture, and strategic importance make it a key player across a range of global challenges, including politics and identity, economic participation and innovation, technology and communication, environment and energy, and security. The India Initiative, a university-wide effort centered in the Walsh School of Foreign Service and its Asian Studies Program, builds knowledge and fosters dialogue around these and other issues of critical importance for India, the United States, and the world.